i am just kidding Luckily it is not that serious anymore. But if you ask germans or dutch against whom they wouldn't like to lose the most, the answer for sure would be Holland/Germany. Personally i would really enjoy a match between them. The trash talking with my dutch friends is always great and a lot of fun. But first there will be the match vs. Ghana tomorrow. Imo they are the strongest african side and they were extremely unlucky in their match vs. USA. If Essien and Kevin Prince Boateng will start for them it is going to be a very difficult match. Overall, i really enjoy this years world cup so far. Graet matches, nice surprises and an awesome athmosphere, especially when south american teams are involved. ah balotelli, and if you lose, what are you going to do for us? how about shut your mouth? so far, holland, chile, costa rica, colombia are through to the round of 16, honduras, cameroon, england, australia and spain are out. france are practically in, brazil most likely in. next week, croatia x mexico and italy x uruguay for a spot in the round of 16.
oh you mean, like holland were eliminated in 2010 in the finals?????? Messi saved Argentina and gave team 2 extra points versus brave Iranian team. I already have mixed feelings about WC and the whole party didn't even started for good Spain is out and it's just heartbreaking for me (I wondered if I should actually own up to these feelings as most people around me are like "You support Spain? hahahahaha" and it's so freakin' frustrating and not helping me to deal with this unexpected defeat at all). Yesterday, another blow to the heart - Mexicans crushing Croats. Poor Vatreni, couldn't stand this view at all And I didn't even have enough time to write here: dang, Luka Modric looks so classy in this hairstyle. And now it sounds just stupid. After yesterday. Ehh. So far the match that gave me the most emotions was Germany - Ghana. Maaan, what a battle Congrats for Miro Klose for "getting" Ronaldo And hope Ghana will make it to the next round. Belgium is disappointing me so far, guys are playing like scared kids, so I'm waiting for more from them 'cause the potential is huge. btw. Why I got such an unpleasant impression that everyone's so happy that Spain is out? And it feels kinda not like Spain was winning everything last years so beat the champion and hahahaha they're already out but it's sth more. Donnu... Just don't get people's attitude toward Spain. What did they actually do to laugh at them so badly and hate them THIS much? Sometimes I think in today's football is about cheering against some team we don't like more than cheering for the team we love We're more focused to see not supported team being beated badly! That's just wrong. But, as for now, Forza! The helll is starting. And Suarez You can love it or hate it but have to admit he's da*n effective monster. Donnu what did he take that he did stand on his feet so fast. Nevermind... Andiamo, ragazzi! 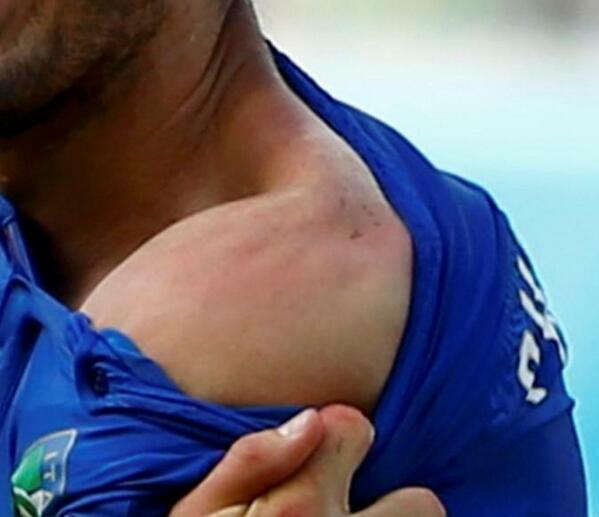 Italy out, Suarez biting Chiellini . This guy obviously has some mental issues, already the third time in his career he is biting an opponent. Can't believe this. Pirlo was almost doubling and even tripling himself during game. Donnu where this team would be without him. And Gigi with this amazing defense and what a joy after that. Can't be that Italians are out Suarez was nothing but a vampire today. Clear situtation and he didn't take the chance. And this whole biting stuff... Nah And I almost liked him... after he sincerely showed how touched he was when Uruguay won with England... W.t.f is wrong with this dude, NO IDEA. Simply likes to bite, was a horse in previous life (looks a bit like that when you see his face with these fangs) or it's like an unconditioned reflex for him to bite everything and everyone. Unreal. To forget about everything sad... Indeed. Blue and pink shoes rock this tournament. Want them. PS. Believe or not but I can't even write W.T.F. without dots. C'mon. This censorship is ridiculous. What a pity Cote d'Ivoire is out... At least Colombia is still on fire with fantastic Rodriguez Good to have a new team to support. PS. Internet is flooded by brand new memes of our football cannibal. More. I read that Suarez wrote that Chiellini tasted wonderfully. Good joke. Fans have imagination.